Don't Ride Drunk, Its Dangerous and it may be Illegal. If you live in California, its illegal. See VC Sec 21200.5. "States and courts are split on the subject of drunk biking. 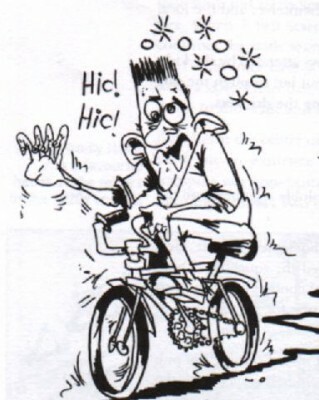 Some people automatically doubt the amount of harm a bicyclist can cause to others, considering the nature of a bicycle. However, some states and their laws acknowledge that, even assuming a bicyclist likely only harms themselves by drunk biking, an injury to a drunken rider can have a profound effect on others, especially their family members. 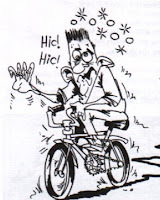 In any case involving an allegation of drunk bicycling, the first place to look to is the DUI/DWI law of that state. Some states exclude bicycles entirely from their definition of "vehicles." Other states limit the application of their DUI or DWI laws to "motor vehicles." But some states treat bicycles as just another vehicle on the road, regardless of the language used within their DUI laws. In these states, drunk bike riders face the same potential legal landmines as any other drunk driver. In general, where a state law on drunk driving specifically prohibits the operation of a "motor vehicle," the chances are very high that the law will be interpreted by courts as not applying to bicycles or similar man-powered vehicles. On the other hand, where statutes apply more generally to all "vehicles," courts sometimes find that bicycles fall into this category. A local attorney can be of valuable assistance in finding out what, if any laws, apply in these circumstances, and can determine whether or not courts in the area have applied state DUI laws to cyclists." Dude, you are posting in the wee morning hours here. I hope that you are not blogging under the influence! Good article to remind us that alcohol is fun and any vehicle can do damage while the operator is less than sober. Long night! See you tomorrow somewhere on GMR! I'll be riding Fixed Gear again. It's not a good practice to drive a bike, motorcycle or a car while under the influence. It may lead to a serious accident and death. So, be careful next time you drive. Make sure not to drive when your too sober. A driver must be a responsible driver. He must now drive if he's too sober or if he's under the influence of any substance. This will prevent accidents that may cause his or others' lives. Driving while under the influence is a big no no. It is punishable by law once convicted. It is important for the drivers not to drive when sober, while under the influence of any drugs (marijuana) and other drugs that may cause severe drowsiness. If you are charged with DUI, then you need to contact your lawyers. Riding a bike is almost similar to riding a motorcycle. So, it is essential to put in mind the importance of following traffic rules and safety measure to prevent accidents. This will prevent extreme accidents that may cause severe injuries to the brain and spinal cords. You need to be very careful in driving in order not to harm yourself or others. It is not a good practice to drive while under the influence of any substance. This may cause severe injuries whenever accident happens. Aside from the hospital bill that you may incur if accidents happen, you will surely shoulder the hospital bills of the victims as well as the necessary compensation they need to restore their lives. Bicycle Law - Accidents, Who is at Fault?